In celebration of Interesting Vancouver’s 10th anniversary, we reconnected with a speaker from each year to find out where they are now. This week we’re featuring the Sḵwx̱wú7mesh-Kwakwa̱ka̱’wakw multidisciplinary artist, Tł’akwasik̕a̱n Khelsilem. Born and raised in his Sḵwx̱wú7mesh (aka Squamish) homelands on the North Shore of Vancouver, Khelsilem has been spending the last four years turning his linguistic dreams into a reality. 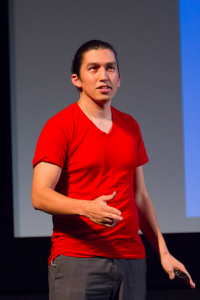 In his IV14 talk, Khelsilem shared some startling facts about Indigenous languages in Canada: BC is home to 60% of Canada’s Indigenous languages, and the 12 Coast Salish languages once spoken in and around Vancouver are almost entirely extinct or critically endangered. The Sḵwx̱wú7mesh language is one of those languages. Of the 4,000 members of Khelsilem’s community, there are only 6 fluent speakers of the Sḵwx̱wú7meshlanguage left. It was getting dangerously close to extinction. But in 2014, Khelsilem moved in with 3 individuals for a language immersion experiment — his goal was to provide the resources needed to produce 4 fluent Sḵwx̱wú7mesh speakers within a year. From there, his dream was to create a full-time immersion program, giving 10-15 people an opportunity to study Sḵwx̱wú7mesh full time (40 hours a week) for a full school year. With 15 new students enrolled in this program every year, the Sḵwx̱wú7mesh language would go from 6 fluent speakers to 150 in 10 years; if they continued on this trajectory, it would increase his community’s fluency to over 10% in 30 years. A few years after Khelsilem’s talk, his goal of creating a year-long adult immersion program in the Sḵwx̱wú7mesh language came true: he’s now teaching full-time at Simon Fraser University (from September to April). Speaking at Interesting Vancouver gave Khelsilem the opportunity to spark genuine interest in his work. In 2014, he gave voice to his linguistic dream and as a result, something big was set in motion. 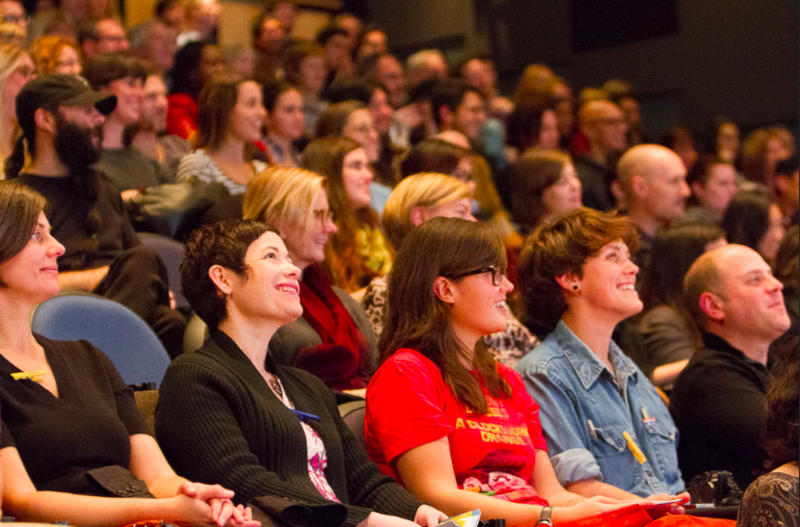 The 10th anniversary for Interesting Vancouver is happening on November 10th. Nominate someone for this year’s IV Prize by clicking here.